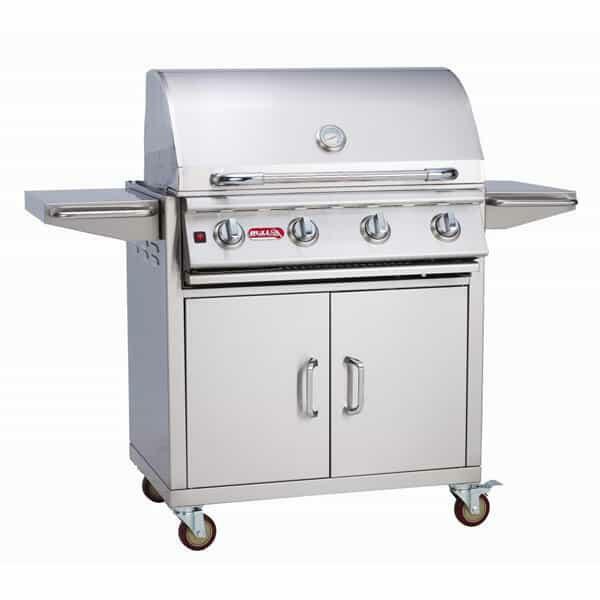 Built with the highest 304-grade stainless steel, this grill stands up famously to unpredicatble outdoor elements that corrode other grills with rust and breakdown. Bull Grills are built with double lined hoods for heat retention and protection against discoloration that usually comes with use. The Lonestar Select Cart runs on liquid propane, and the tank can hide in the lower compartment on the cart for protection. The grill head component offers an impressive cooking grid that gives a huge 810 square inches of cooking space. Four main burners work to deliver 60,000 BTUs of solid heat for the biggest grilling experience for your dollar. The burners are made with welded stainless steel for strength and reliability. The Lonestar Select won’t let anything stand between you and a perfectly cooked succulent burger, not even nighttime! If you engage the inner-mounted lights, you'll be able to make nighttime cooking a breeze. Enjoy the wise innovations of Bull Grills!